Two chances to catch it on the big screen: Wednesday, February 27 and Saturday, March 2! 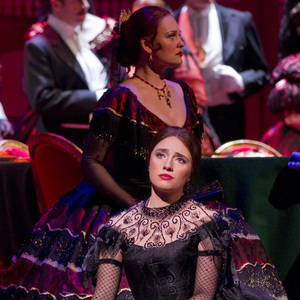 From the thrill of unexpected romance to a heartbreaking reconciliation that comes too late – Verdi’s La traviata is one of the most popular of all operas. Alfredo falls in love in with the courtesan Violetta in glamorous Paris society, but underneath the surface run darker undercurrents, leading to a tragic ending. The opera’s wealth of melodies includes the famous Brindisi and the exuberant ‘Sempre libera’ – both showing the lyricism of Italian opera at its most immediately appealing. Richard Eyre’s production for The Royal Opera brings out all the emotional colour, from the giddy discovery of love, through painful confrontation to the inevitable conclusion. Lavish period sets and costumes enhance the reality of a moving story based on true life. Sung in Italian with English subtitles. Runtime: 3h35 minutes including two intermissions.